James Bear uncovers the intricate mechanisms that allow certain cells to move, discoveries with implications for cancer metastasis. A cell from James Bear’s lab. 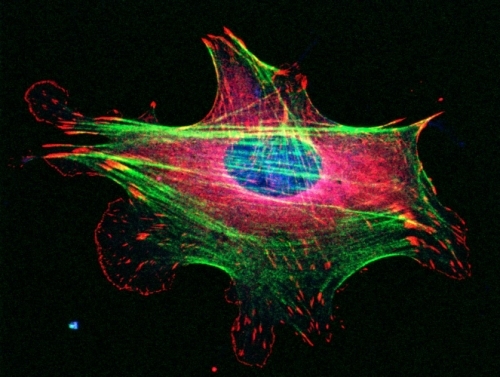 Red indicates focal adhesion structures. Green is the Myosin II protein. Blue is actin filaments. They work in unison to help cells, including cancer cells, move throughout the body. What if cancer cells couldn’t move? What if patients — once they’re diagnosed with cancer — could take a drug that made cancer cells immobile? The answer is simple: Survival rates would skyrocket. But reality is complicated. It’s hard to know with precision how metastasis happens. But that’s what cell biologist James Bear is trying to do — understand cell movement so he and others can do something about it. The problem is that, when cancer cells move, eradicating them becomes nearly impossible. This is the so-called Stage IV cancer — when cancer cells in one organ take up residence in several other parts of the body. Bear’s lab at the UNC Lineberger Comprehensive Cancer Center is unraveling the mysteries of cell migration one tiny cellular mechanism at a time. Much of the time his team works with healthy cells. Turns out, even understanding how normal cells migrate is no easy task. And, as Bear can attest, sometimes a seemingly simple experiment turns into a three-year experimental odyssey of trying to understand how even common, healthy cells such as fibroblasts move. So, how do they move? Big picture: Cells move thanks to their cytoskeletons — miniature, internal skeletons composed of filaments, which are made up of proteins. How those proteins interact with each other and their environments is more complicated. It’s just that, with cells, the rivets are binding proteins that must attach the filaments together at specific angles so cells can move. One of the main binders is a protein complex called Arp2/3. “For a long time, scientists thought that you couldn’t study Arp2/3 in a lab because as soon as you manipulated it, the cell would die,” Bear says. But in 2012, Bear’s lab managed to manipulate Arp2/3 in fibroblasts. In fact, his lab was the first to generate a viable cell line without Arp2/3. This allowed his team to study the precise role of Arp2/3 in cell movement that depended on cues in the cells’ environment. That’s crucial because all cells move in specific ways and certain directions depending on cues — like car drivers picking up ques from street signs. This directed movement is called chemotaxis. “We assumed that fibroblasts would not be able to chemotax without the Arp2/3 complex,” Bear says. So he set up a basic control experiment to prove it. His team used a technology called “microfluidics” to create a tiny chamber wherein cells could move and Bear’s team could study the movement over time. Studying such cell movement had been difficult to accomplish with previous technologies. At the heart of the research was the question: “Well, what do fibroblasts need in order to move up the gradient?” This question began a series of complex, frustrating experiments that eventually led to a culprit. And it’s one that could very well be important in diseases such as fibrosis, which is a chronic obstructive pulmonary disease (COPD), a very serious condition of the lungs. Bear applied a chemical inhibitor of myosin — proteins that aid in muscle contraction — and the cells could migrate at a decent speed, but they did so randomly, no longer capable of responding to a directional cue in their environment. To find a solution, his team conducted genetic experiments to disable two different kinds of myosin, myosin IIA and myosin IIB. When they knocked out myosin IIB, the cells could still chemotax. Without myosin IIA, however, the cells couldn’t move at all. Down at the bottom of this three-year rabbit hole, Bear found what fibroblasts absolutely need in order to move according to a directional cue: protein kinase C, which inhibits myosin IIA and creates the force that pushes cells along. According to Bear’s research, it is the only thing that cells cannot rescue through some alternative means to restore chemotaxis. These findings were published in 2014 in the journal Developmental Cell. James Bear is an associate professor of cell biology and physiology in the UNC School of Medicine, a member of the UNC Lineberger Comprehensive Cancer Center. The National Institutes of Health funded this research. Bear is an early career scientist at the Howard Hughes Medical Institute.